Your mouth is one of the most important, and often overlooked parts of our body. What’s more, just like every other important body part (i.e., our brain, heart, and lungs), our mouth requires vital nutrients, like; key minerals, essential oils, enzymes, and vitamins. Without vital nutrients, our mouth can’t function and susceptible to disease. The result? Our teeth will fall out. But gets even worse! To have a healthy mouth is to have a happy life. To be happy, our mouth needs a constant dose of nutrients. Unfortunately, we don’t eat like we should and our diet does not provide ample amounts of these key nutrients. No wonder nearly 50% of the American adult population suffers from gum disease. a healthy mouth (strong white teeth, pink gums, and long-lasting fresh breath). That’s not an easy question to answer. But if we were to give a general description of a healthy mouth we would use words like… strong white teeth, pink gums, and long-lasting fresh breath and any absence of decay or disease. This is where Revitin steps in, coming to the rescue. Revitin natural toothpaste provides all the essential nutrients to ensure we all have a healthy mouth. A healthy mouth starts and ends with a balanced Oral Microbiome. We gave you a general description of a healthy mouth, but now let’s dig a little deeper. A healthy mouth starts and ends with a balanced Oral Microbiome. Okay, then what is an Oral Microbiome? Oral Microbiome is a fancy word that describes the mouth’s delicate ecology and/or ecosystem. Our mouth is like the planet we live on. If we abuse our mouth or our planet, there are serious consequences – like global warming and climate change. If our description of a healthy mouth seems complicated (scientific), its because it is – complicated. The Oral Microbiome is comprised of over 600 prevalent taxa at the species level, with distinct subsets predominating at different habitats, otherwise referred to as the oral microflora, oral microbiota, and the commensal, symbiotic, and pathogenic microorganisms. Revitin® is made from a patented formula consisting of all natural ingredients. Revitin patented this incredible toothpaste formulation and now enjoys its exclusive use – which we happily share with all of our loyal customers. Revitin is the most powerful restorative toothpaste formula ever invented – bar none! What are the results one should expect when using Revitin’s one-of-a-kind formula? Simple, the results are strong white teeth, healthy clean gums, and long-lasting fresh breath – all made possible by the important role Revitin’s ingredients play in the natural enhancement of the oral ecology. Exactly Why Does Our Mouth Need Vitamins? If you want healthy teeth and gums make sure your diet consists of all the key nutritional building blocks, including vitamins. Or, another option is to supplement your diet by using Revitin. The truth is that our mouth cannot survive or thrive without key vitamins. 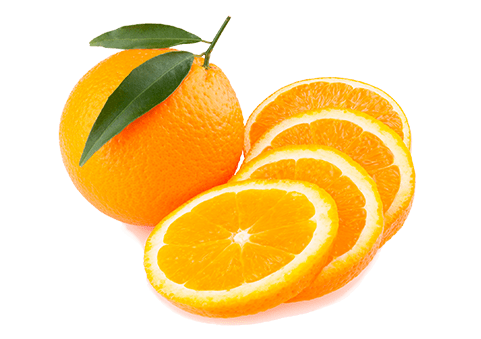 Vitamin C for example, is known to strengthen gums and the soft tissue of the mouth, thus protecting us against gingivitis, periodontal disease, and tooth loss. Without Vitamin C, you would eventually become a toothless wonder. Don’t know about you, but we don’t want to risk the health of our mouth, so pass over a tube of Revitin – Let us have some of those vitamins for the mouth! Exactly Why Does Our Mouth Need Enzymes? First, enzymes are the secret weapon to achieving long-lasting fresh breath. Secondly, we would die without enzymes. They are absolutely essential to our existence. Regardless of what is more important to you, fresh breath or breathing, enzymes are pretty darned important. Enzymes are fundamental elements to respiration and cellular metabolism. Enzymes are key factors for hundreds of important functions that allow us to live and breath and absolutely key to enjoying a healthy, balanced oral microbiome. Specifically, enzymes work to break down or modify food compounds such as starches and proteins – without enzymes, our teeth would rot and our gums would become infested with disease. Exactly Why Does Our Mouth Need Minerals? Well, did you know that our teeth mainly calcium? Teeth are composed mostly of calcium, but there is some phosphorus and other minerals, too! But mostly calcium. Our teeth are calcium deposits. Did you know that the calcium in our teeth must be replenished all the time or they will crack, crumble, and fall out? So consuming calcium on a daily basis is important. Revitin, made with calcium, helps keep tooth strong and healthy. Consuming too little of calcium is one of the fastest ways to acquire gum disease, experience tooth decay, and become toothless. Our Water is exclusively from the high Rocky Mountain Region of the Wasatch watershed and purified to a level of USP pharmaceutical purity. Dental Silica is a cleaning component that is best described as a microscopic, smooth cleaning pebble; which is safe to eat and passes through the GI tract without microbial or biological activity. Our Xanthan Gum is produced from a Probiotic ferment and is a Prebiotic substrate for the good bacteria, leading to a balanced oral ecology and ultimately better oral health. Vitamin C is an essential vitamin used by your gums and your probiotics. There is a particular form of Vitamin C that works in the mouth, called Sodium Ascorbyl Phosphate. Clinical Data on this specific form of Vitamin C demonstrates activity against bacteria involved in caries and gingivitis. By promoting the good bacteria, called oral probiotics, this sets the stage for better oral health. Quillaja extract is a concentrated, purified extract of the outer cambium layer of the Quillaja Saponaria Molina tree, commonly identified as Quillaja bark, native to Chile. Quillaja is the natural foaming factor in many natural carbonated drinks and is used to break up biofilms in the mouth as a gentle cleaning agent. Calcium carbonate is calcium salt that is abundant in nature. The pure form used in this formula is extracted from oyster shells. The extraction is so pure, there is no protein reactivity; and is safe for those with shellfish allergies. Tangerine Oil is a low dose essential oil, extracted from Tangerine fruit that has a positive effect on the general oral terrain. Cranberry Seed oil has essential fatty acids that support resolution of inflamed gums and supports a healthy oral microbiome. MSM is an organic sulfur compound that’s naturally derived during the earth’s rain cycle. MSM is a potent inflammatory resolution by disallowing the removal of cellular metabolic waste. Unlike its synthetic counterpart, natural Chondrus Crispus Seaweed is a prebiotic used to balance the oral ecology. Non-GMO vegetable glycerin, or glycerol, is a natural component of Non-GMO coconut oil; and is a clear, odorless liquid. This healthy Triglyceride is healthy for the oral microbiome and an excellent source fatty acids. Lemon Oil is a low dose essential oil, extracted from Lemon fruit that has a positive impact on the general oral terrain. Vitamin E is composed of fat-soluble compounds, called tocopherols, with distinctive antioxidant activities. Vitamin E is used by and absorbed into the gums and probiotics in the mouth. 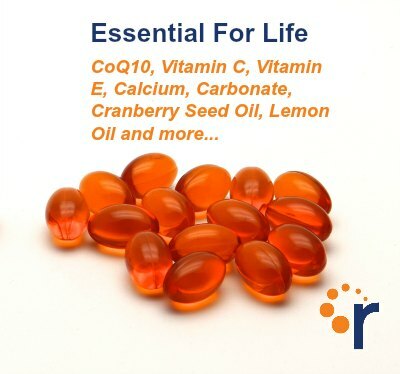 Coenzyme Q10 is a naturally occurring coenzyme found in every plant and animal cell. Supplemented CoQ10 serves as an endogenous antioxidant which increases the concentration of CoQ10 in the gums and effectively suppresses advanced periodontal inflammation. Stevia contains phytonutrients, minerals, vitamins, trace elements, and volatile oils; which give Stevia its nutritional and medicinal properties for healthy teeth and gums. Clinical studies show selective prebiotic properties of Stevia may help with gingivitis, cavities, tooth decay, and mouth sores. Also, it may suppress the development and reproduction of infectious organisms in the gums and teeth, inhibit the growth of plaque, and may improve overall oral health by promoting the selective growth of healthy probiotics. Revitin’s advancements in the study and support of the Oral Microbiome are reversing the unhealthy practices that are causing a majority of Americans to suffer from gum inflammation, bleeding gums, tooth decay, and bad breath. 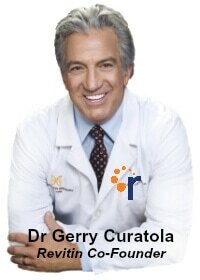 Revitin’s customers are experiencing an actual revolution within the dental and oral care world! With Revitin toothpaste, you’ll find only the highest-quality natural ingredients. Equally as important, you won’t find fluoride, sodium lauryl sulfate (SLS), sodium laureth sulfate (SLES), antibacterial ingredients, parabens, artificial colors, alcohol, or any other insane additive. 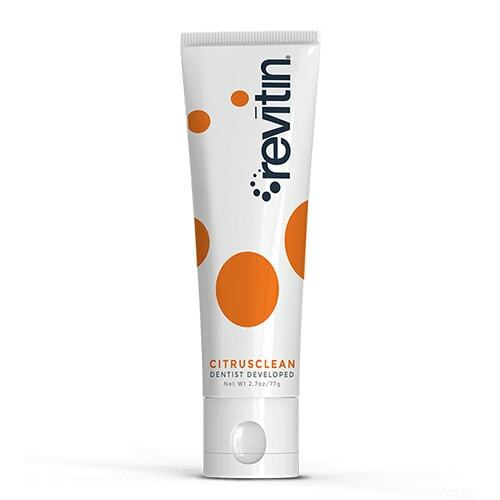 Revitin is a chemical free, detergent free, and antibacterial free toothpaste. “Give yourself a healthier clean! Join the Toothpaste Revolution”. This entry was posted in Beauty Trends, Latest News. Bookmark the permalink.